Troi URL Plug-in can help you fill in web forms on internet, all from FileMaker Pro. It also retrieves data or images from any http and https URL. Of course the actual form and result can be quite different and more complicated in your situation. Troi URL Plug-in adds the TURL_AuthorizeWithCallbackScript function, which lets a user authorize Troi URL Plug-in to use a web service, for example Twitter. After authorization a script is triggered with a script parameter which contains the access token and secret. By storing these you can then use the web service (like sending a tweet). Currently this is a macOS only function. On both macOS and Windows you can use the function TURL_SetAuthCredentials, which enables you to set the Consumer Key and Consumer Secret for an OAuth authorization. This makes it possible to work with web services that use OAuth 1.0A. The plug-in comes with an OAuthWebService example file which demonstrates the OAuth functionality for Web Services and the TURL_SetAuthCredentials function. 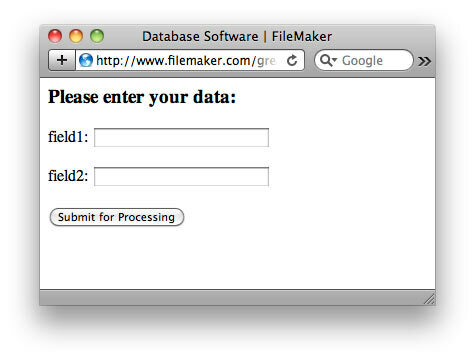 Send (authorized) tweets from FileMaker! Twitter uses the OAuth protocol to secure their Twitter API. We have included a separate Twitter example file which shows you how to use Troi URL Plug-in’s functions to authorize for working with a Twitter account and post tweets from FileMaker. After authorization, tweets (and other commands) can be sent for an account from FileMaker without the need to log in. Troi URL Plug-in can automatically detect if web pages are UTF-8 encoded and get the result with the right encoding into FileMaker. Get images right into a container field! It is possible to get JPEG and GIF and even PNG images directly into a container field. This allows you to harvest images, like photos directly from a web site! get online data like stock quotes, weather reports, etc. You are free and invited to test the plug-in before you pay. Troi URL Plug-in is fully functional in demo mode, it will only stop working after 2 hours of testing. Download your copy here. Troi URL Plug-in 6.0 adds compatibility with FileMaker 17. This version adds a new TURL_AuthorizeWithCallbackScript function, which makes authorizing the plug-in to use a web service easier on macOS. It lets a user authorize Troi URL Plug-in to use an OAuth protected web service, for example Twitter. After authorization a script is triggered with a script parameter which contains the access token and secret. By storing these you can then use the web service (like sending a tweet). See the Version history below for a complete list of changes in this and earlier versions. Added new TURL_AuthorizeWithCallbackScript function, which lets a user authorize Troi URL Plug-in to use a web service, for example Twitter. After authorization a script is triggered with a script parameter which contains the access token and secret. By storing these you can then use the web service (like sending a tweet). Currently this is a macOS only function. Updated the code base, the plug-in now uses more modern C++ libraries. (macOS) Removed old code dealing with resources. Updated the EasyInstallTroiPlugins.fmp12 file, it can now run a test registration script for a plug-in after you have installed it on FileMaker Server. correctly in the function pane on the right. (macOS) Fixed a compilation problem with code signing and extended attributes in Mac OS 10.12 (Sierra). Made small corrections to the user guide. Updated the example files for FileMaker Pro Advanced 17. Tested and made compatible with FileMaker Pro 16. Added new functionality to the TURL_Get function. When getting images, like jpegs, the name of the image (like for example img_4321.jpg” is now also added to the container data. Fixed a problem with creating the correct OAuth signature for parameters in the TURL_SendAuthorizedRequest function. Fixed a problem with the TURL_SendAuthorizedRequest function for urls that contain extra parameters (after a question mark: like www.example.com?page=1). Improved the internal registration of function calls of the plug-in, making it more robust on more platforms. Several bug fixes and further improvements. Made various minor changes to the example files to better work with FileMaker Pro 16. Updated the code by adding improved namespace handling to make the plug-in more robust. The URL Plug-in adds multiple script steps when running FileMaker Pro 16. You can select these script steps in the script steps pane in Script Workspace, or you can begin typing the script step name, then choose the script step from the list that appears. NOTE Only steps that perform an action have been added as a script step. Functions that just return information (like for example TURL_GetLastHTTPStatusCode) are only available as an external function. Added new scripts to several example files, which demonstrate how to use the new external script steps of FileMaker Pro 16. The examples check if FileMaker Pro 16 is running and will select these new scripts. Added support for online help for the functions and script steps of the plug-in. You can now easily get online help from the Troi website, by clicking the Help button (the small question mark button) next to the function description in the functions pane or the script step description in the script steps pane. Tested and improved compatibility with Windows 10 and OS X 10.11 (El Capitan). Tested and made compatible with FileMaker Pro 15. Added new function TURL_GetLastHTTPStatusCode: this function will return the HTTP response status code from the last executed HTTP request. Added description and type-ahead information for all functions of the plug-in. This extra function description will be shown in FileMaker Pro 15 in the Specify Calculation dialog box when you type a function name and also as a text popup in the functions pane on the right. The type-ahead information is used by the auto complete functionality of FileMaker Pro 15. In the calculation pane of the Specify Calculation dialog box you can type a letter or two of the function name and instantly see a list of matching function names. For example when you type “pos”, the auto complete functionality will suggest the TURL_Post function. You can also type a function name in the functions pane on the right: for example if you type “auth” you will see all the functions relevant to authorization, like TURL_GetAuthorizationURL. Improved the multi-threading behavior of the plug-in when running in FileMaker Pro 15. Improved the example file EasyInstallTroiPlugins.fmp12, to provide more help when an installation error occurs. Fixed several bugs, rewrote and modernized the code in several places and made further improvements. Updated the User Guide and the Overview.fmp12 file. Tested and made compatible with FileMaker Pro 14. Added support for 64-bit architecture with FileMaker Pro 14: On OS X the 32-bit and 64-bit version is a single universal plug-in and on Windows there are 2 plug-ins: Troi_URL.fmx (for 32-bit) and Troi_URL.fmx64 (for 64-bit). Improved the example file EasyInstallTroiPlugins.fmp12, to support the 64-bit version of FileMaker Pro 14. Fixed a bug that could make FileMaker Pro 14 become unresponsive after calling TURL_Get and TURL_Post function. For older release notes please see here. single user, 10-user and 25-user license: these are meant for using the plug-in client-side, on FileMaker Pro and FileMaker Pro Advanced, including with files hosted by FileMaker Server. You need a license for every user that makes calls to the plug-in’s functions. developer license: this license is meant for FileMaker solution developers, who want to include the plug-in with their solution(s) and distribute it to their end-users. Each of your end-users may use the plug-in with up to 25 users (contact us if any of your customers has more than 25 users). The number of organizations you distribute the plug-in to and the number of solutions you distribute it with are not limited. Works on FileMaker Pro and FileMaker Pro Advanced, including with files hosted by FileMaker Server. Go to the developer license page for more info. server/web license: this license registers the plug-in for use on FileMaker Server and FileMaker Server Advanced. You only need this license if you want to use the plug-in in server-side scripts and in web published databases. It has no user limit. Go to the server-side plug-ins page for more info. All licenses work both on macOS and on Windows. If you have a license for a previous version, you can buy an upgrade for version 6.0. If you bought a license on or after June 26, 2017, the upgrade to version 6.0 is FREE! Note: eligible users have been sent a new 6.0 registration. Contact us if you have not received yours. “First, I wanted to thank you guys for creating such excellent plug-ins. They fill pretty much all of the gaps in FileMaker and really go a long way into making it into the Swiss Army knife of cross-platform solution development. The other reason I wanted to write is that I think you are sitting on a real game changer that potential customers might not be aware of without making it a little more obvious. I am referring to Troi URL’s ability to make FileMaker into an incredibly powerful web client, in particular for communicating with SQL databases. I have been absolutely blown away with what I can do in this regard with the plug-in. Combined with Troi File and Troi Encryptor it delivers the ability to create very fast (VERY fast), very secure SQL applications that provide a ton of extended capabilities over any browser-only based solutions. The link below points to a page on my site that explains a little more about the concept. We are still collecting more comments. If you have any remarks on the URL Plug-in please send us your comments. Thanks! Function and script step reference. See a list of Frequently Asked Questions about this plug-in. Communicating with a web server is done with the help of status codes. Some of those may be returned by the plug-in. Using Troi URL plug-in to make FileMaker Pro into an incredibly powerful web client, in particular for communicating with SQL databases. (Older) information on how to convert databases which use Troi URL from FileMaker Pro 6 to FileMaker Pro 7 and later. Post and retrieve information from internet!